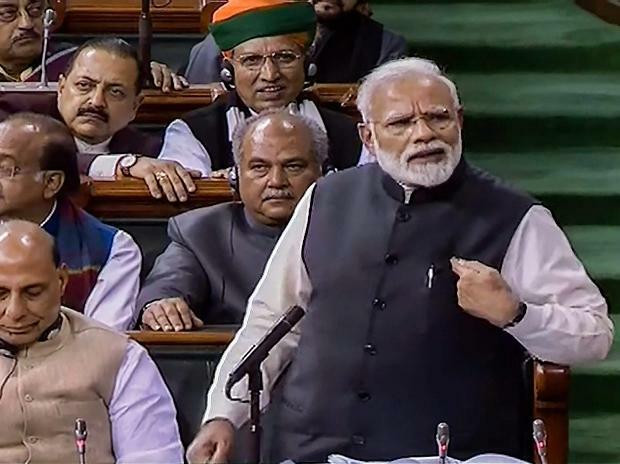 Prime Minister Narendra Modi's reply on the motion of thanks on the President's address saw him trade barbs with the leader of Congress in the House, Mallikarjun Kharge. In his over one-and-half-hour marathon speech, Modi asserted that his Bharatiya Janata Party (BJP) would win the forthcoming Lok Sabha elections and again give chance to the Congress to move a no-confidence motion, while Kharge termed his claim "arrogance". Modi's remarks referred to a motion of no-confidence moved by the Congress in July 2018 against the Central government, which comfortably secured a two-thirds majority against it. Gesturing at Kharge, Modi said that "you do preparation in a way that you have to move a no-confidence motion in 2023". In response, Kharge said: "This is your arrogance." Modi then said it was their "service to the nation" and the Congress's "arrogance" that brought it to this position. There was a short exchange between the two leaders when Modi made a gibe at the senior Congress leader, saying that he is "a very decent person but always sends dissent notes", referring to Kharge's position on the future of then Central Bureau of Investigation (CBI) chief Alok Verma and selection of new agency chief Rishi Kumar Shukla. Citing Kharge's speech earlier in the day in the House, in which the Congress leader had mentioned about the preachings of 12th century social reformer Basavanna and advised the Central government and its ministers to follow it, Modi said: "Khargeji, if your party had adopted the path shown by the saint, you (Congress) would not have been in this condition. "Your party leaders should have put the teachings of Basavanna in their offices, if you are afraid to put my photo."